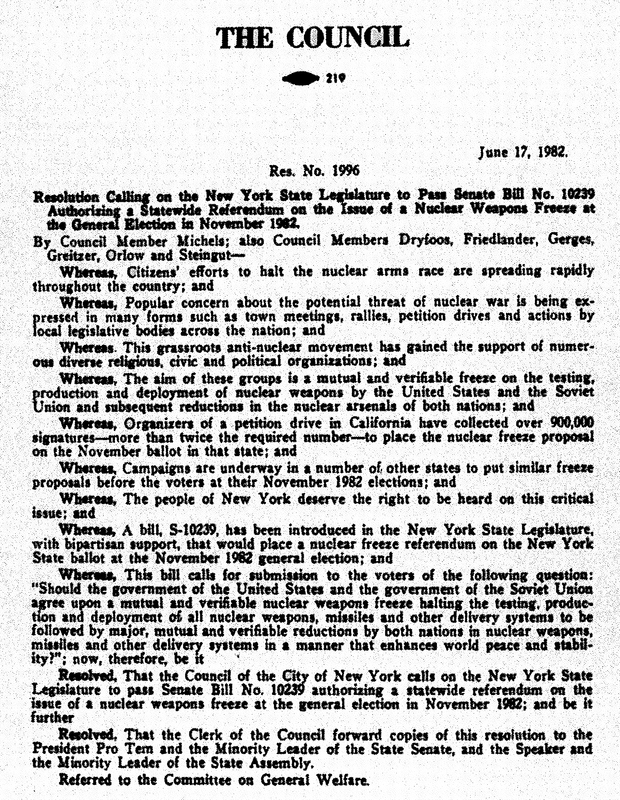 This is a list of New York City Council Resolutions on nuclear weapons and other nuclear issues from 1956 to the present. Thanks to Anthony Donovan for collecting them from various archives and scanning them all. Note that some of the scans are from microfiche and so are not necessarily great quality. 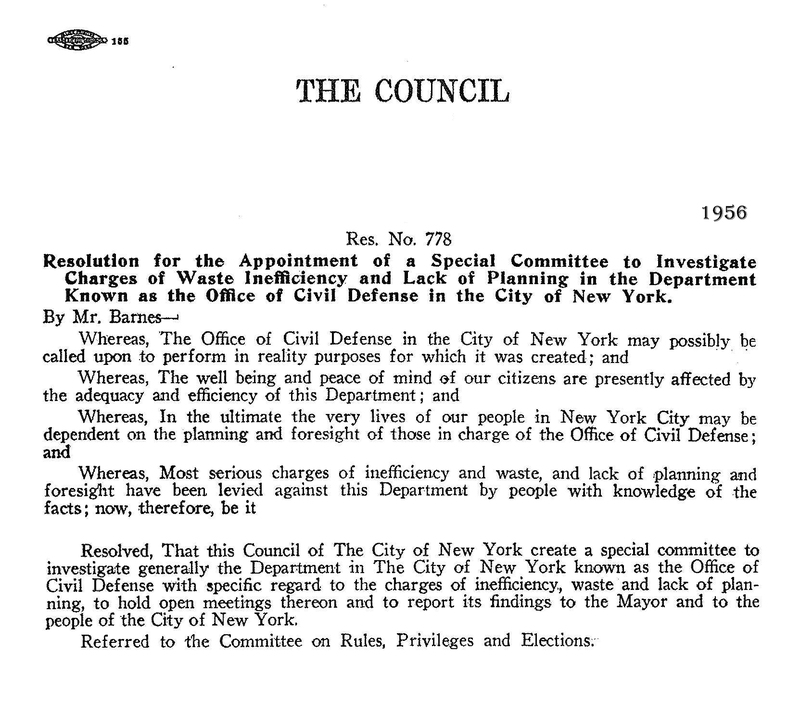 1956 – Resolution 778: “Appointment of a Special Committee to Investigate Charges of Waste Inefficiency and Lack of Planning in the Department Known as the Office of Civil Defense in the City of New York.” Download. 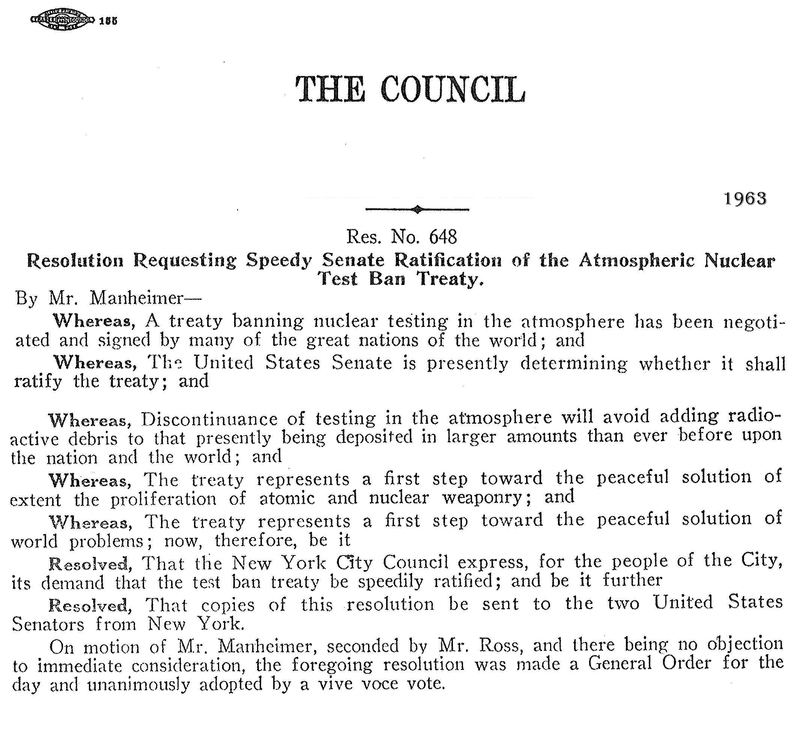 1963 – Resolution 648: “Requesting Speedy Senate Ratification of the Atmospheric Nuclear Test Ban Treaty.” Download. 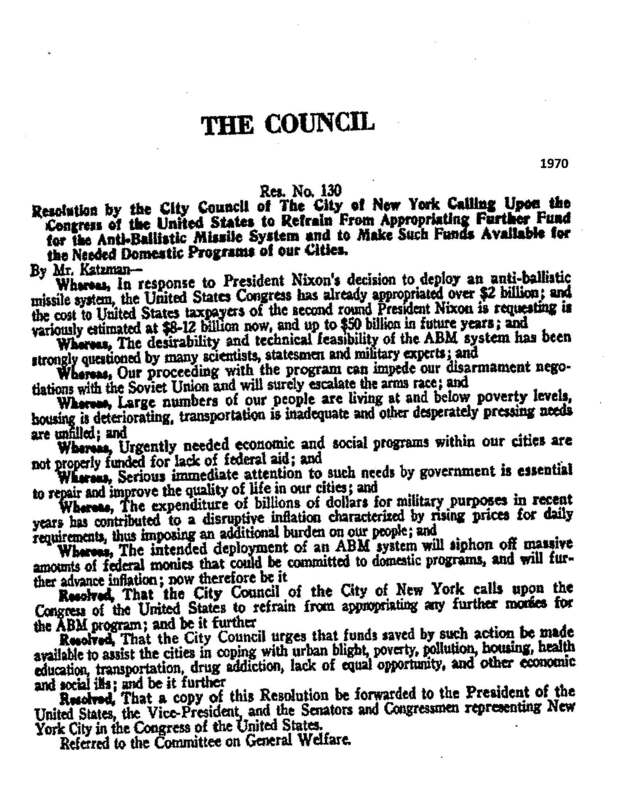 1970 – Resolution 130: “Calling Upon the Congress of the United States to Refrain from Appropriating Further Funds for the Anti-Ballistic Missile System and to Make Such Funds Available for the Needed Domestic Programs of our Cities.” Download. 1979 – Resolution 512: “Calling Upon the President of the United States to Issue a Call for an Emergency Meeting of All Nuclear Nations to Plan an End to the Escalating Arms Race.” Download. 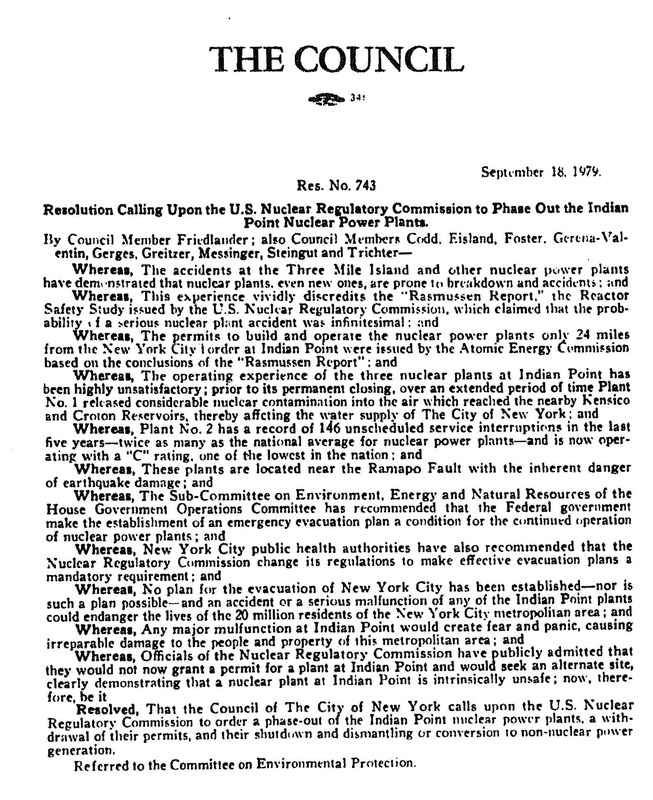 1979 – Resolution 743: “Calling Upon the U.S. Nuclear Regulatory Commission to Phase Out the Indian Point Nuclear Power Plants.” Download. 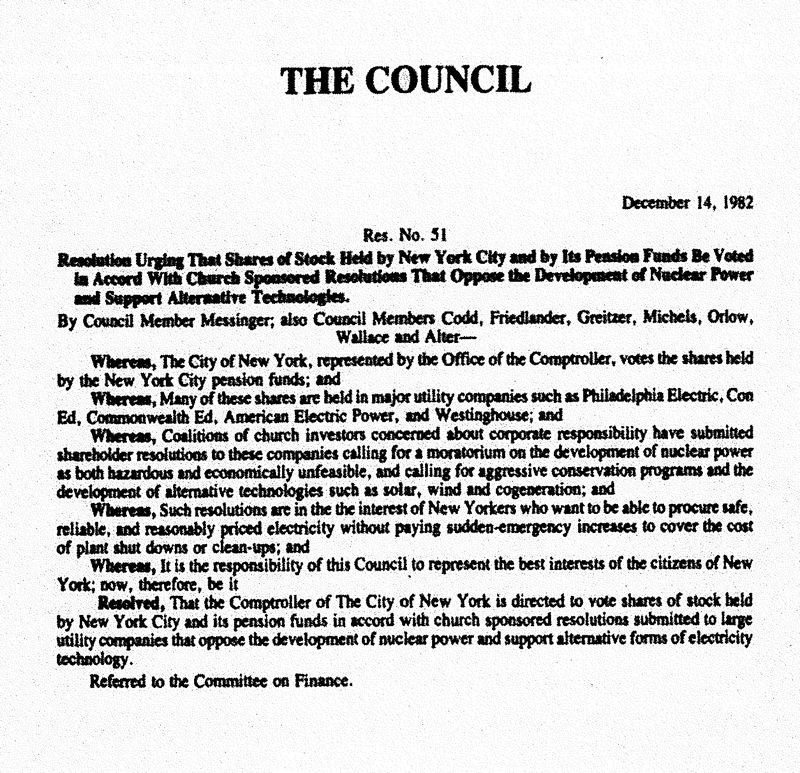 1982 – Resolution 51: “Urging that Shares of Stock Held by New York City and Its Pension Funds Be Voted in Accord with Church Sponsored Resolutions that Oppose the Development of Nuclear Power and Support Alternative Technologies.” Download. 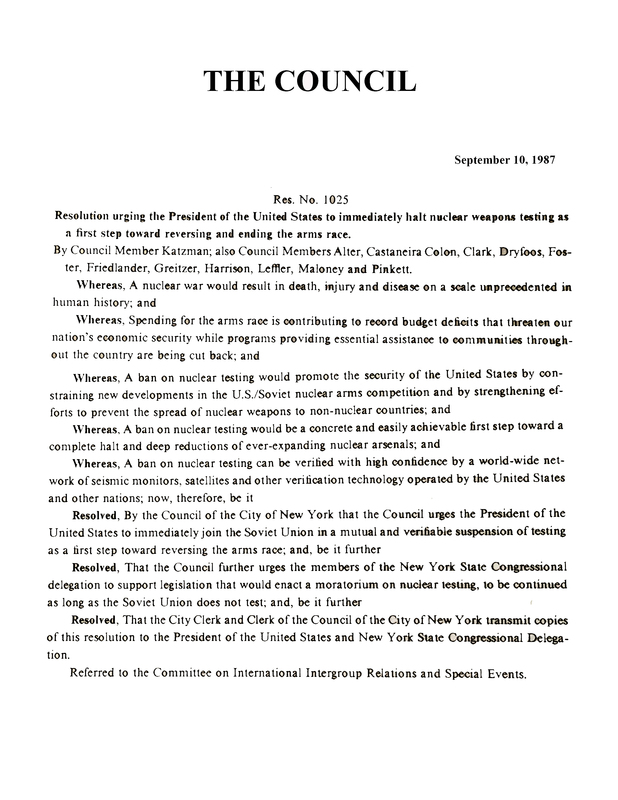 1982 – Resolution 1840: “Calling Upon the Government of the United States and the Soviet Union to Negotiate a Mutual Freeze on the Testing and Production of Nuclear Weapons and Calling Upon the New York City Council to Declare June 12, 1982 to Be Peace Day.” Download. 1982 – Resolution 1907: “Supporting Passage of House Joint Resolution 434 and Senate Joint Resolution 163 Calling for a Mutual and Verifiable Freeze and Reduction in Nuclear Weapons by the United States and Soviet Union.” Download. 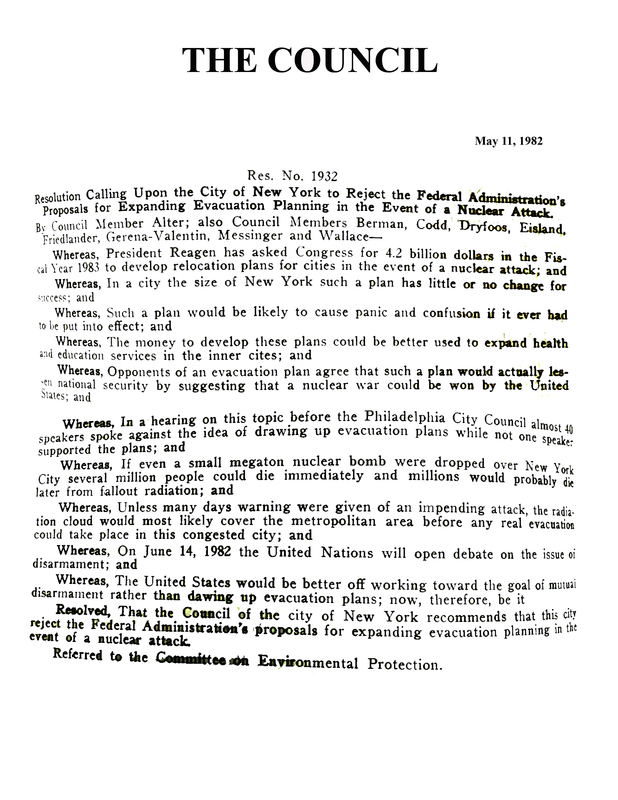 1982 – Resolution 1932: “Calling Upon the City of New York to Reject the Federal Administration’s Proposals for Expanding Evacuation Planning in the Event of a Nuclear Attack.” Download. 1982 – Resolution 1996: “Calling on the New York State Legislature to Pass Senate Bill No. 10289 Authorizing a Statewide Referendum on the Issue of a Nuclear Weapons Freeze at the General Election in November 1982.” Download. 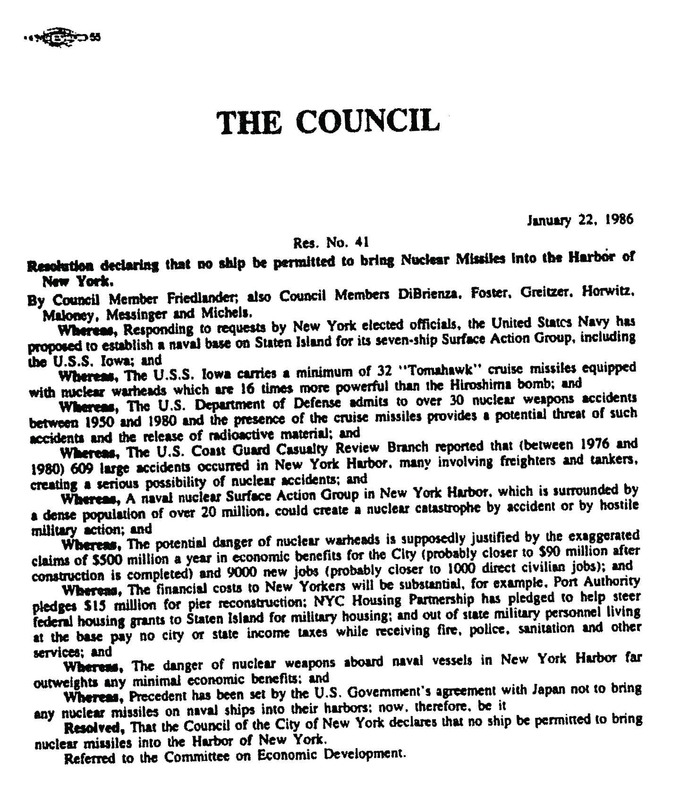 1983 – Resolution 364: “Calling upon the Council of the City of New York to Prohibit the Production, Transport, Storage or Deployment of Nuclear Weapons within the City and Proclaiming the City a Nuclear Weapons Free Zone.” Download. 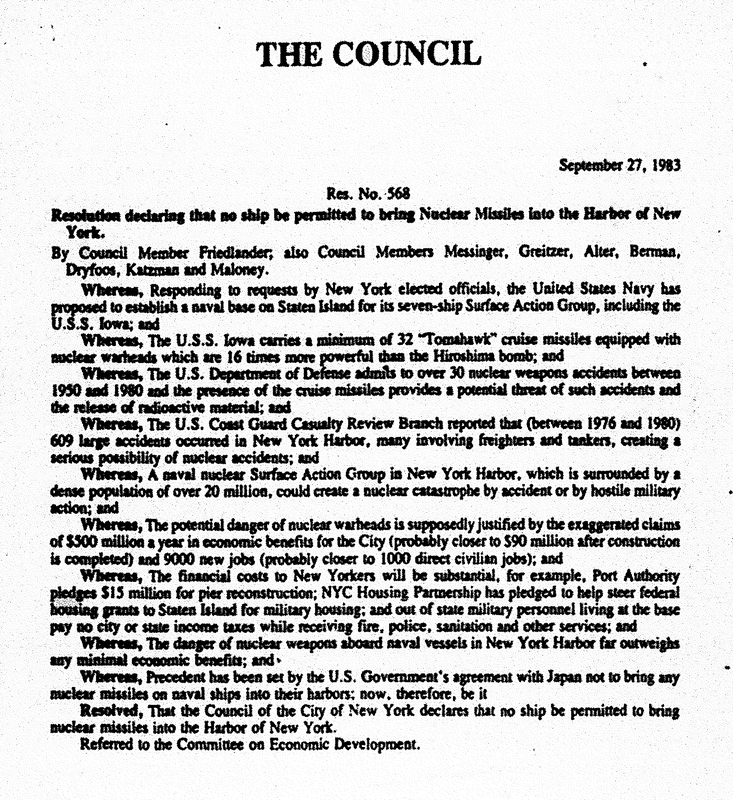 1983 – Resolution 568: “Declaring that No Ship Be Permitted to Bring Nuclear Missiles into the Harbor of New York.” Download. 1986 – Resolution 41: “Declaring that No Ship Be Permitted to Bring Nuclear Missiles into the Harbor of New York.” Download. 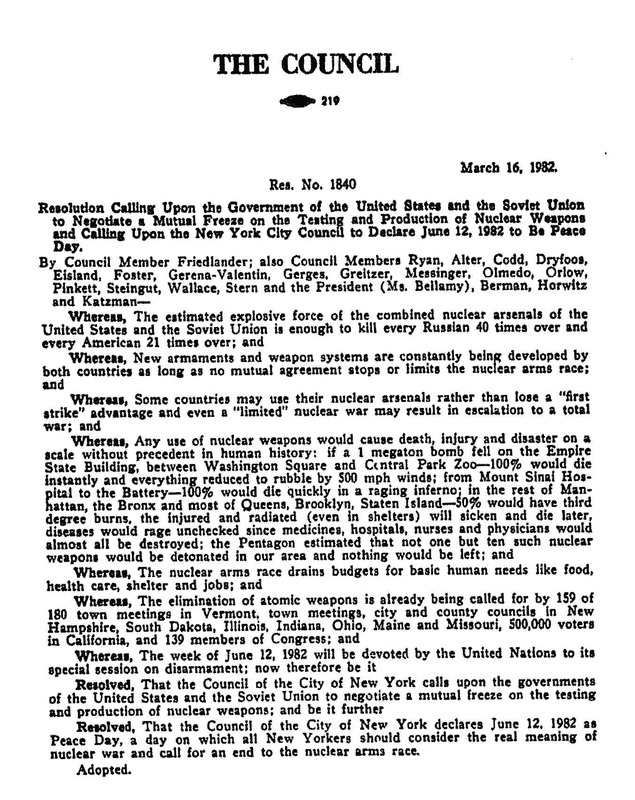 1986 – Resolution 258: “Urging the President of the United States to Negotiate with the Soviet Union to Produce a Nuclear Test Ban Treaty.” Download. 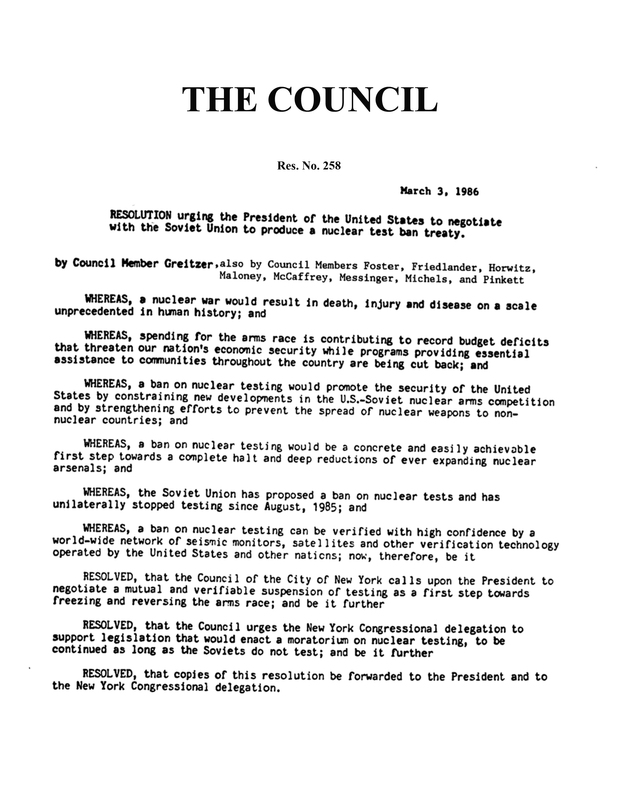 1987 – Resolution 1025: “Urging the President of the United States to Immediately Halt Nuclear Weapons Testing as a First Step Toward Reversing and Ending the Arms Race.” Download. 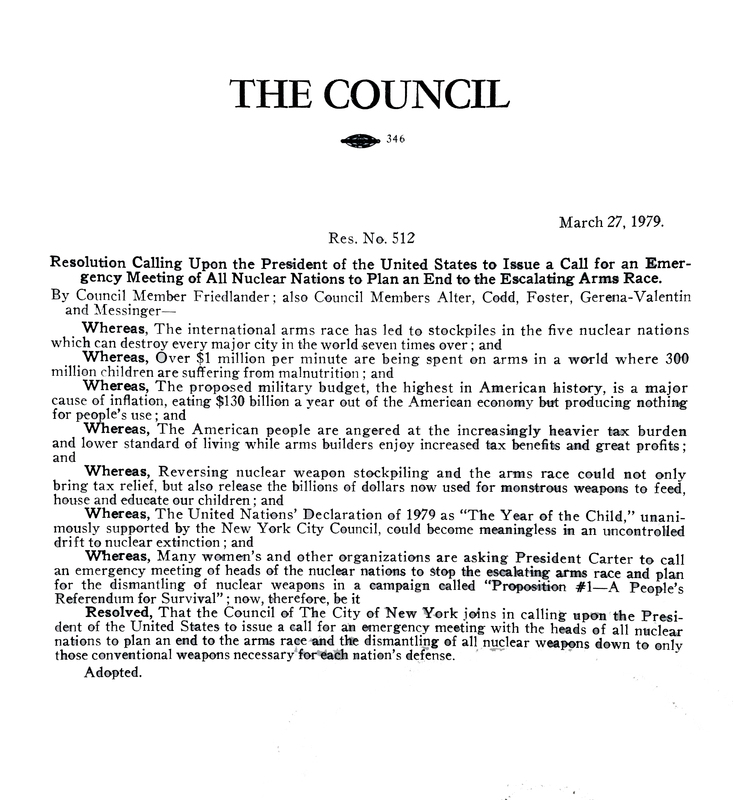 1987 – Resolution 1056: “Urging the President of the United States to Immediately Halt Nuclear Weapons Testing as a First Step Toward Reversing and Ending the Arms Race.” Download. 1990 – Resolution 136: “Urging the President of the United States to immediately halt nuclear weapons testing as a first step toward reversing and ending the arms race.” Download. 1990 – Resolution 137: “Calling Upon the United States to Negotiate a Comprehensive Test Ban Treaty with the Soviet Union.” Download. 1999 – Resolution 878: “Declaring the City of New York a Nuclear Weapon Free Zone and support the further development of Nuclear Weapon Free Zones throughout the world.” Download. 2002 – Resolution 549: “Oppose the Congressional Resolution allowing President George W. Bush to unilaterally declare war against Iraq.” Download. 2015 – Resolution 694: “United States Nuclear Regulatory Commission not to relicense Indian Point 2 and Indian Point 3.” Download.